1993 / Created the first multimedia products in the digital space. Were the first stories in digital written by the media. Launched products on Prodigy & CompuServe (pre-web). 1994 / Created the first website for a band starting in the web's infancy. Received global press and won design awards. Story here. 1997 / Sold the internet's first digital single. Six years before iTunes. Called "a turning point for an industry" by WSJ and "one of the most significant milestones in the history of the music industry." - Billboard. Story here. 1998 / Created first entertainment deal with Mark Cuban and AudioNet/Broadcast.com (pre-Yahoo acquisition). 2000 / Streamed the first full album online. Radiohead's album debuted at #1 because fans could hear the album before purchase which shifted the industry's fear of putting music online. Story here. 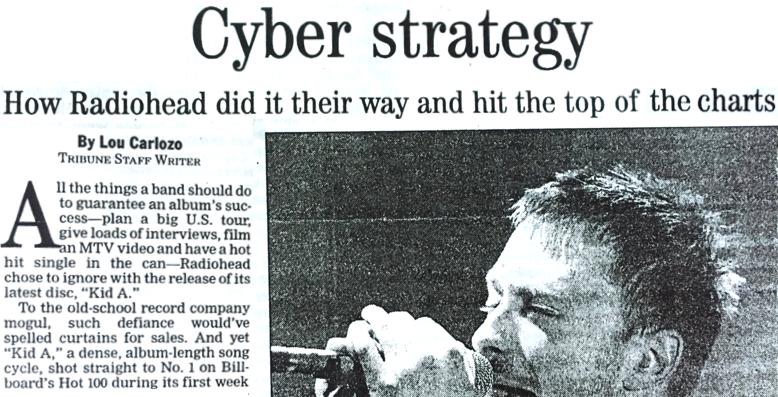 2001 / Created the first music chatbot for Radiohead. Story here. 2001 / Used the internet to break new artist Josh Groban. 2003 / Started first mobile division in entertainment. 2003 / Sold the first MP3 with Madonna. First artist to reach #1 on Billboard with digital sales only. Huge PR story but still remained highly controversial with entertainment executives. 2003 / Launched iTunes with Apple. Convinced the biggest artists in the world to put their music in the platform and created iTunes first partnerships. 2003 / Discovered MySpace, suggested they put music on the platform. Launched first song on MySpace profiled in WSJ. 2004 / Worked with Green Day to launch a first of its kind ringtone campaign and we created one of the very first mobile TV spots in history to promote it. We also created a new product for the music industry (custom CDR's) profiled in Entertainment Weekly. 2005 / Partnered Madonna with Steve Jobs & Apple. Steve called Madonna during his presentation where we launched Madonna's entire catalog into iTunes. 2006 / Discovered YouTube and brokered their the first deal in entertainment. 2006 / Created YouTube's first "channel" and first entertainment promotion with 50+ artists, celebrities, musicians and brands. 2006 / Pioneered YouTube in its infancy. Signed artist and created unique music video that hit #1 on YouTube. 2007 / Created new industry product (USB Drives) for White Stripes. Grammy nominated. 2008 / Launched the first celebrity on Twitter (Tom Petty) and partnered with the Super Bowl. 2008 / Created unique web product for Tom Petty, nominated for a Webby. 2009 / Partnered with Facebook to sell industry's first virtual goods. 2010 / Grew Britney Spears from 1M in audience to 60M including reaching #1 on Twitter and #3 Trending Topic of the year. 2011 / Partnered Spotify with Bechtel Ventures clients for their launch announcement. Profiled in WSJ.